There are no two ways about it – it’s a challenge to borrow money with bad credit. Banks are likely to turn you down and many of your other options are undesirable. But you don’t have to settle .The good news is that LoanNow can provide the money you need even if your credit isn’t perfect. If you approach a bank to borrow money with bad credit, the answer is more likely than not to be no. If you are approved, you may be required to provide collateral or a credit worthy cosigner as a condition for being approved. And regardless of your credit profile, you may have to wait weeks for a response. If you’re seeking a loan to deal with a financial emergency – waiting weeks to hear from a bank is not viable. On one level, a pawn shop is the ideal place to borrow money with bad credit. Pawn shops issue loans with no credit checks and no questions asked – as long as you have merchandise they consider valuable that you’re willing to surrender (temporarily) as collateral.. However, pawn shops typically loan only about 25 percent of the value of the property you surrender as collateral. You must also repay the loan in full, with interest, within 30 to 60 days, or risk losing your property for good. 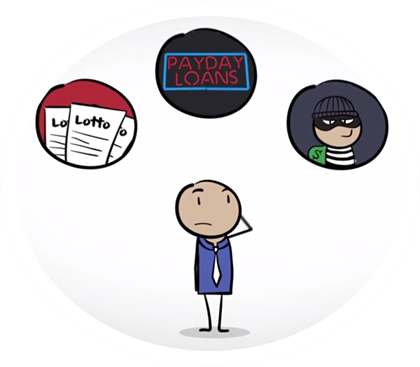 Payday lenders make it easy for people to borrow money with bad credit. Their main concern is whether you have a job or a steady source of income – along with an active bank account. But the initial convenience of a payday loan is soon overshadowed by realization that your loan is due in full in just a few short weeks. If you’re paid every week, your loan could be due in as soon as 10 days! If that sounds like it would be hard to manage – that’s because it is. A majority of payday loan borrowers wind up trapped in a cycle of partial payments and rollovers for months – sometimes even for years. If you’re trying to borrow money with bad credit, it’s easy to become discouraged – or fall into the trap of a bad loan. But LoanNow is a better alternative. With us, you’re more than your FICO score – less than perfect credit is not necessarily a deal breaker. LoanNow also never requires collateral – and we say NO to rollovers. Let LoanNow provide the money you need – when you need it!